At Aircool we stock 137 different-sized cooler pads, ranging from 10 x 18 to 40 x 40, and on up into large industrial sizes. With the exception of 25 x 33, all of our cooler pads are made in even numbers, so if your pad measures to an odd number, just round up to the next even number to get your size of cooler pad! We can also custom make cooler pads for the individual that has a rare unit or a different application. Because we manufacture cooler pads daily, we can usually custom make your pads within two days. As our reputation for a quality product and customer satisfaction has grown, our market has expanded. We now ship aspen cooler pads from Colorado to California and from Texas to the state of Washington. Come by or call to see if we have your size cooler pads in stock. 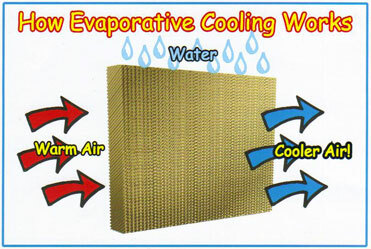 REMEMBER: Buying Aircool pads insures perfect evaporative cooler pads every time!